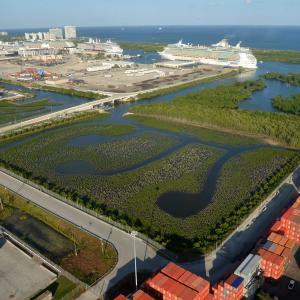 BROWARD COUNTY, FL -- Through a creative green initiative, Broward County&apos;s Port Everglades is addressing a berthing capacity shortfall by developing new wetlands that support wildlife and ecological quality in the center of an urban, industrial seaport. The Port Everglades Wetland Enhancement Project recently received a "Notification of Trending Towards Success" from the Florida Department of Environmental Protection for successfully cultivating 16.5 acres of nursery-grown mangrove and native plants on property that was originally dry land intended for other uses. The notification is a critical component to the Port&apos;s berth expansion effort because it releases 8.7 acres of an existing mangrove conservation easement adjacent to docks. The released acres will be excavated and the Southport Turning Notch will be expanded to make way for up to five new cargo ship berths. "We worked closely with port users, the environmental community, especially the South Florida Audubon Society, and the Florida Department of Environmental Protection (FDEP) to develop a plan for the new mangrove habitat that almost doubles the amount of mangrove conservation area in a more environmentally advantageous location within port property. It is a win for Port Everglades and a win for the environment," said Port Everglades Chief Executive and Port Director Steven Cernak. The project recently won IHS Maritime and Trade magazine&apos;s Dredging and Port Construction Innovation Award in the "Working/Engineering/Building with Nature Award" category. According to IHS, the "Nature category winner demonstrates an active and innovative response to the preservation and promotion of the following areas: wildlife, reduction in air emissions, water quality, treatment of soils/sediments, community engagement and sustainability." As Florida&apos;s top container seaport, Port Everglades needs more dock space to accommodate today&apos;s growing number of larger cargo ships that are bringing goods to South Florida&apos;s growing population of 6 million consumers and 110 million visitors statewide. Cargo ships often are forced to anchor offshore until berth space opens up, which is costly for shippers and ultimately for consumers. Extending the Port&apos;s Southport Turning Notch, a vessel turnaround and berthing area, will help relieve the Port&apos;s berth congestion problem by lengthening the notch from approximately 900 feet to 2,400 feet. In addition to the berth area, the project includes adding up to six Super Post-Panamax cranes that will accommodate Post-Panamax cargo ships already coming from Europe and South America, and will also handle ships from Asia through the newly expanded Panama Canal. Surplus mangroves that were not used for maintenance plantings were donated to the Broward County Parks and Recreation Division and planted within the nearby West Lake Park restoration areas with the help of more than 40 volunteers. DeRose Design Consulting designed the new highly engineered, structurally complex marine wildlife habitat that hosts the mangrove plants, that was completed in July of 2015.The Port Everglades Department&apos;s Seaport Engineering and Construction Division managed the project. Earth Balance Corporation grew 100,000 mangroves seedlings (some as reserves) at two different nurseries within the state while the site work was completed. Bergeron Land Development, Inc. was the construction manager for the $15.8 million project. Plans are underway to transfer the ownership of the land and entire conservation easement, almost 60 acres, to the State of Florida.